Whether you have just started using the dentures or you have been using them for years, you may wonder about the ways to make them stay in the mouth fittingly. Even if your dentist has fitted these dentures in your mouth securely, you may still want to feel the sense for security with the use of dentures. In that scenario, the best thing you can consider is to use the denture adhesive. There are many forms the denture adhesives are available in. The common ones are gel, powder, paste, and pads. Knowing what type you need or even if you really need the adhesive is surely worth asking from your dentist. Nevertheless, there are some ways you can determine if you really need to denture adhesive. Denture adhesive is basically a product which is used in the undersides of the dentures. Adhesive basically acts as the layer between your gums and the denture, and it is used to ensure that the dentures you use don’t get slipped from the place. Whether you use full or half dentures, you can use adhesive to get an extra sense of security with the dentures. Do you need denture adhesive? Denture adhesive shouldn’t be used right away. You first need to speak to your dentist if you feel there is a problem with the proper fitting of dentures. The dentist will most probably try to refit the dentures. In general scenario, if your dentures are properly fitted in your mouth, you don’t need to get denture adhesive. One thing worth mentioning here is that ill fitted dentures can result in injuries or infection in the oral cavity. Hence, you rather need to go for the dental visit instead of applying adhesive without consulting any professional. However, if your dentures are fitted properly and there is that small irritation due to little mobility of the dentures, you can apply adhesive to get some peace of mind. Types of denture adhesives include gel, paste, powder and pads. 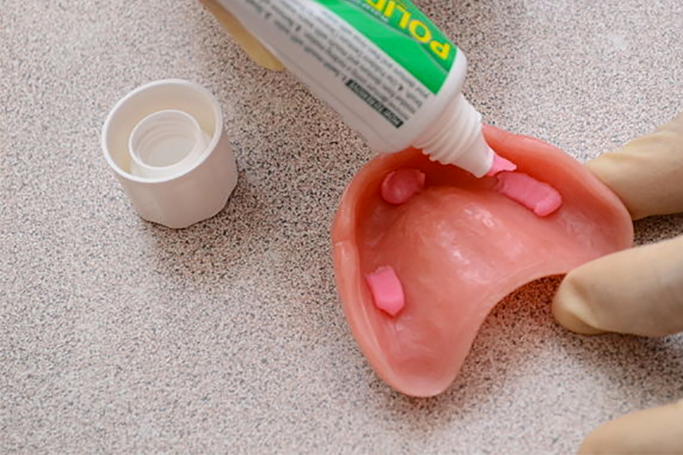 Gel and paste can be directly applied to the dentures. On the other hand, you will need to mix powder in the water in order to make a paste to apply to the dentures. When it comes to the use of pads, you need to trim the pads in order to make them adjustable for dentures. This little customization will make it an adhesive according to your requirement. Generally, there are no side effects of denture adhesive. But, sanitization may become a problem if you are not careful about the routine cleaning. Hence, it is essential to clean the adhesive every evening before you go to bed.